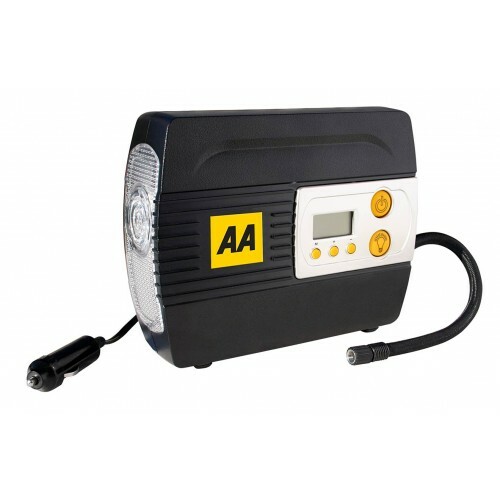 The AA Digital Air Compressor is a multi-functional unit primarily designed to inflate vehicle tyres up to a maximum pressure of 120 PSI, with a power.. The AA Compact and Lightweight Air Compressor is capable of inflating a tyre from zero to 30 psi in less than 10 minutes yet it is small enou..
AirMan's industry leading tyre sealant technology is designed to seal punctures up to 6mm, ensuring the highest quality tyre repair solution on t..
AirMan’s ResQ Tyre Repair Kit is the two piece system including the compressor and the sealant bottle. Perfect for all types of passenger vehicle.. Suitable for cars, motor bikes, Cycle tyres and Sport balls Locking valve connector Non slip foot plate Quick release Locks down for easy storage .. Heavy duty double footpump TUV/GS approved Adaptors included Locking valve connector Locks down for easy storage Non slip footplate Two cylinder.. Heavy duty single footpump TUV/GS approved Adaptors included Locking valve connector Locks down for easy storage Non slip footplate .. This universal track pump is designed to fit all sizes of bicycle tyre and fits both Presta and Schrader valves Made from a strong resin material..